Built for the Touring purist. The Milwaukee-Eight® 107 gives you plenty of get-up so the miles fly by. It’s just you, the wind and the road. Attention Ladies!! Join us on April 25th to experience all things Harley-Davidson has to offer and to learn more about the motorcycling community! 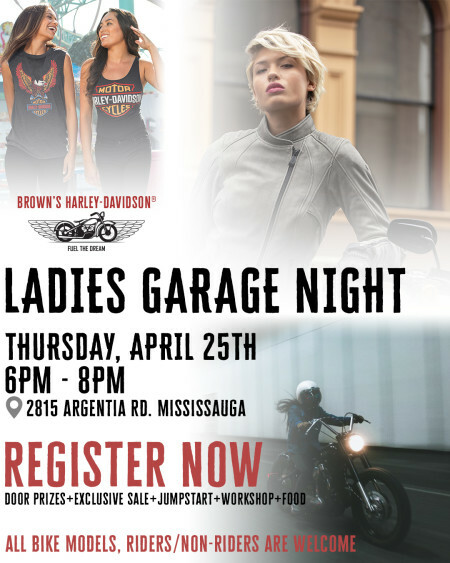 Ladies Garage Night is for everyone, whether you have no experience, a little or a lot, there is something for everyone! We'll have special in-store sales, door prizes, jump-start, workshop on how to get ready for the season, and catered food!! Register now and we'll see you all soon! 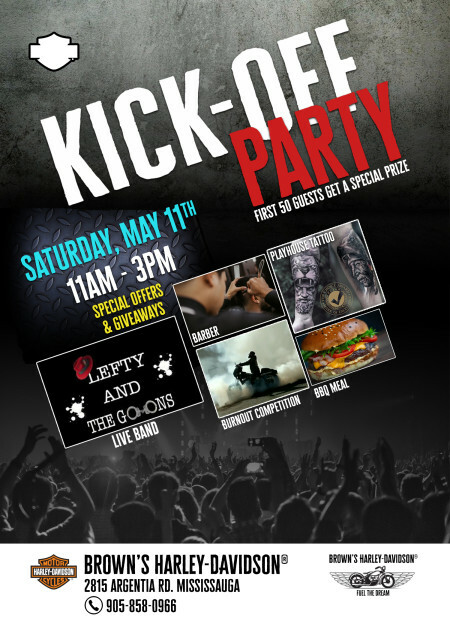 Brown's Harley-Davidson® invites you and your family to join us on Saturday, May 11th from 11am - 3pm to celebrate the start of the riding season with a Kick-off party, we'll also be celebrating our 2-year anniversary. Cheryl and Mike Brown welcome you to our site. We are a new family-run Authorized Harley-Davidson Dealership located in Mississauga, Ontario. 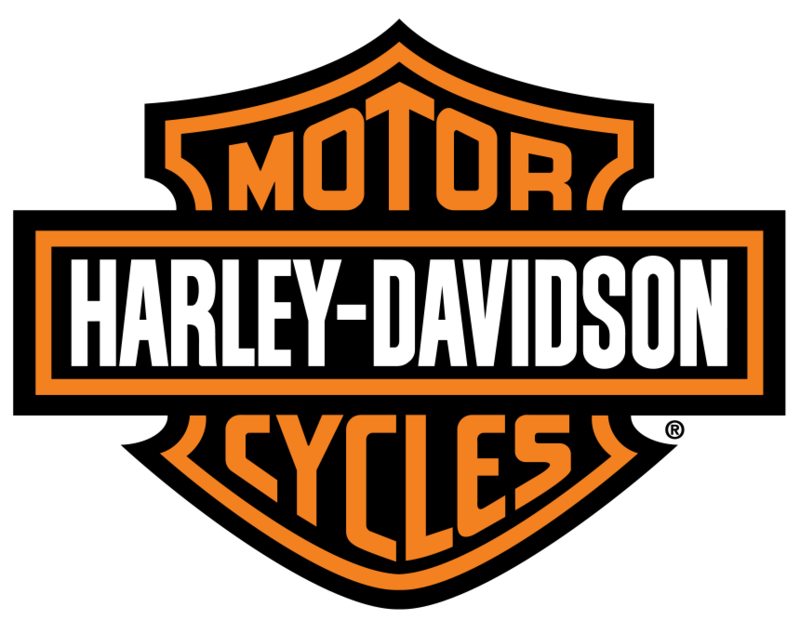 We are committed to offering our customers the highest level of service and quality products that Harley-Davidson has to offer. From the minute you walk through the door we want you to feel like you belong. 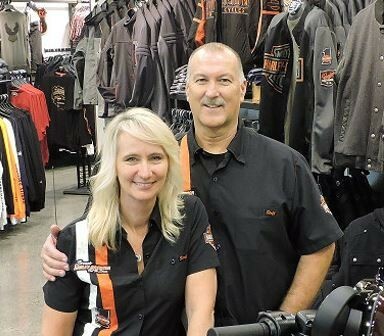 Our dealership family is made up of some of the most experienced Harley-Davidson technicians, parts consultants and salespeople the industry has to offer. Our team will ensure your experience is like no other. We have a variety of new products arriving daily in all the latest model Motorcycles, Parts & Accessories, and MotorClothes®. We are the dealer sponsor for the Milton Chapter HOG group and take pride in our community involvement. We are a family of avid Harley-Davidson riders and we represent all things Harley-Davidson. We service the area of Mississauga, Milton, Georgetown, Carlisle, and surrounding. 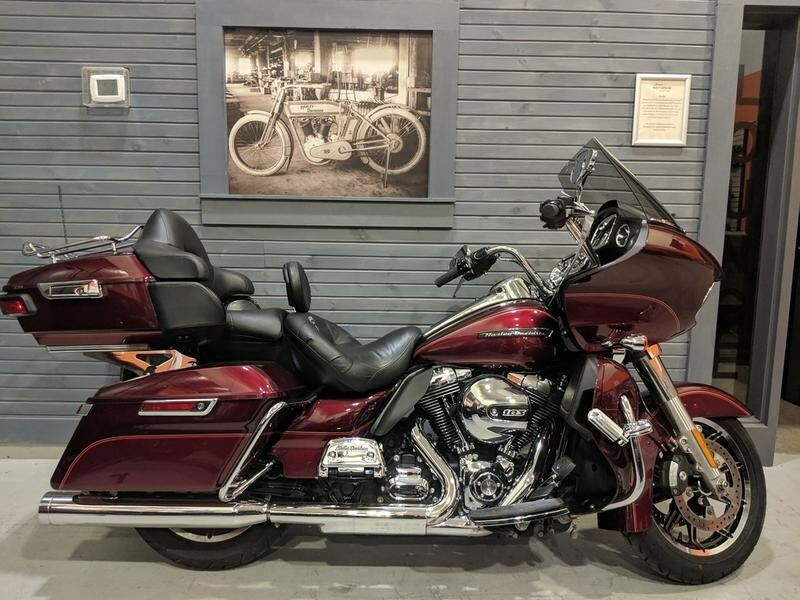 Come on in soon, and often to pick up the latest gear and accessories, buy your next bike, service your current one and just reconnect with old friends and meet new ones.